All students are required to dress appropriately in dance attire. Hair should be neatly tied back and placed in a bun for all ballet classes. Storybook Dance – Leotard with white ankle socks or tights and ballet slippers. Preballet & Preballet II – Light pink cap sleeve leotard with pink tights and pink ballet slippers. Ballet I – White cap sleeve leotard, pink tights, pink ballet slippers. Ballet IA, II, IIA & III – Black cap sleeve leotard, pink tights, pink ballet slippers. Ballet IV & Up – Black cami style leotard, pink tights, pink ballet slippers. (Leotards should not have attached skirts) Pointe students may wear skirts. Boys – Black shorts or tights, white t-shirt, white ballet slippers. Jazz/Tap – The above attire with black tights and jazz shoes applies to all Jazz & Tap classes. Required dance-wear and dance shoes must be worn to all classes. 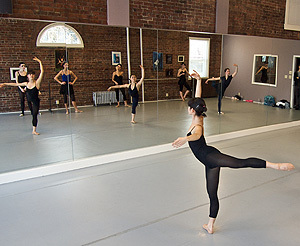 Failure to wear required dance wear to class could result in students asked to sit out of class. Repeated failure to wear required dance-wear could result in termination of lessons. Students are not permitted to wear jeans or shoes worn on the street or outdoors, to any dance class. For safety reasons dancers are not permitted to wear jewelry. Long hair must be tried back. Barre Fitness – Any appropriate workout attire is acceptable to wear to the Barre Fitness class.